If you've been wondering what Final Fantasy Type-0 is going to be like, Square Enix has just launched an official site with a fair amount of info on it. Square-Enix is having a big news day. First there was the news that the new Hitman game (probably) has a name. 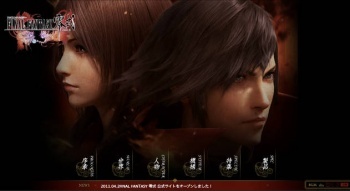 Now, it turns out the latest Final Fantasy game, dubbed Final Fantasy Type-0. This may be just me being confused, but the site lists different names for two of the game's four countries. Rubrum, the main country, and Milites, the invading nation, are the same. The other two are now called "The Lolica Commonwealth" and "Concordia Kingdom." Just as Rubrum is associated with the Suzaku crystal and magic and Milites is associated with the Byakko crystal and science, Lolica is associated with the Gebnu crystal and shield, and Concordia with the Souryuu crystal and dragons. The character section includes three character descriptions for Ace, Queen, and Nine (I'm detecting a poker theme here), and it explains their different attacks and strengths/weaknesses on the battlefield. Unsurprisingly, the images on the site look stunning. If you can read Japanese, or just want to see the original images, check out the site; if the former isn't the case, then check out Andriasang's write-up.